Deere & Company (DE): Are You Prepared This Time? Last year’s drought brought upon a massive destruction of crop yield, which sent crop prices to 6 year highs. This year is turning no different, as the weather reports suggest that last year’s drought may very well continue in 2013. This would certainly send fertilizer companies soaring, but agricultural equipment providers like Deere & Company (NYSE:DE). could have a hard time ahead. Since cash flows from selling crops had plunged last year, farmers had little to spend on their farm equipment. If the drought continues this year as well, farmers would again abstain from purchasing the equipment, thus extending the bad times for agricultural equipment manufacturers. As a matter of fact, the street was extending normal weather in 2013 following which shares of Deere & Company (NYSE:DE) had risen by nearly 40% since September. But after drought reports popped out in February, its shares tumbled by more than 10% and are continuously declining. 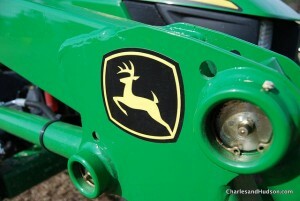 Deere & Company (NYSE:DE) is the world’s largest agricultural equipment manufacturer around the world, and dons a market cap in excess of $34 billion. It derives around 40% of its revenue from international sales (mainly India and China), while the U.S accounts for just over 50% of its sales. But China and India are also witnessing continued drought and the crop yields are continuously being destroyed. With agricultural revenue under pressure, there isn’t much to be excited about agricultural equipment manufacturers. But not all companies are expected to have a tough time. AGCO Corporation (NYSE:AGCO) derives 70% of its sales from Europe and South America, which are expected to have normal weather conditions. As it happened last year, the drought in the U.S, India, and China drove up international crop prices and farmers in the rest of the world had a fantastic year. This was followed by strong sales of agricultural equipment in Europe and South America, and as a result, AGCO reported a 53% surge in its quarterly profits. Since the weather cycle seems to be repeating itself, AGCO Corporation (NYSE:AGCO) could have another blockbuster year. Analysts estimate its annual EPS to grow by 12.5% for the next 5 years. CNH Global NV (NYSE:CNH) also stands to benefit here. The company derives most of its revenue from Europe and it has been reporting fantastic results over the last year. As a result, its shares have risen by 30.5% over the last 6 months and it is still looking strong. At the current price, its shares appear to be undervalued with a forward P/E of 8 and a PEG of 0.75, suggesting that its shares are deeply undervalued.